We have taken a few close looks at chat bots recently, focusing on what they can do, why we should use them, how they fit in within the realm of contact center software, and even a breakdown of when and how they’re being used. But looking at statistics and numbers all day long will only tell you so much. We can understand what percentage of users prefer chatbots, or prefer them to which interactions, but that still doesn’t show us exactly how they are being used. 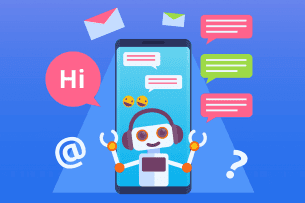 As we discussed previously, there are a number of ways to improve overall chatbot engagement, and really urge your customers and clients to take advantage of this really helpful technology. But without the real-world examples of exactly how they’re being used, it can be difficult to truly wrap our minds what we need to improve and why. So, in order to provide that understanding, we are going to take a closer look at some true real-world examples of customer service chatbots in action. I don’t want to keep repeating myself here, but I want to first layout the groundwork for where chatbots are in the world. And the reality might not be what we want it to be. Unfortunately, we are at a point where the hype of chatbots and live chat, as well as other related customer service trends and capabilities, is far beyond the truthful experiences and results. In short, our expectations and promises of chat bots are much higher than the true real-world results. There is truth to the chatbot madness, people do like them for specific reasons, and will be willing to use them for specific scenarios. 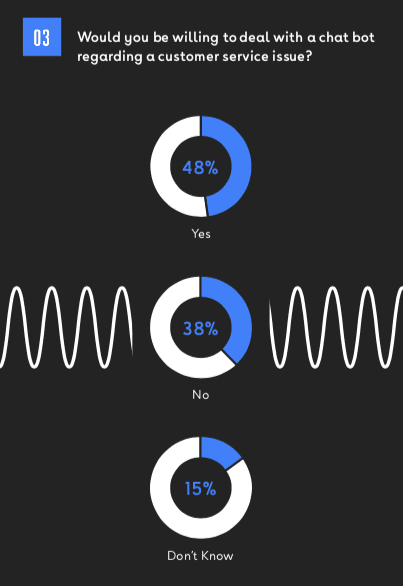 In NewVoiceMedia’s report that I took a close look at, in fact, 42% of respondents said they would be willing to deal with a chat bot for customer service. 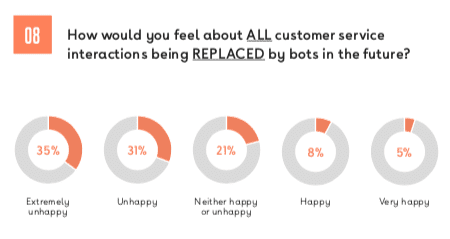 But, at the same time, 75% of users said they preferred a live customer service agent, and only 13% preferred a chat bot. There are a number of ways we can work to encourage end users and customers to engage with chatbots, but what it mostly comes down to is providing users with a concrete reason to use them, and a positive experience. Humans truly appreciate a human connection, and human interactions; this is ultimately why customers and clients will prefer to interact with live customer service agents, and not just a bot. The largest concerns that users have when it comes to bots is a lack of understanding, and a lack of nuance. People are complex, our wants and desires and needs are complex, and if a bot cannot grapple that complexity then people will simply end up frustrated. And as we know, when customers are frustrated, they will then blame the company, blame the chatbot, and never want to bother again — and rightly so. When it comes to chatbots, and AI in general, we need to have a more truthful and honest conversation: not just for our own benefit, but for the customers benefit as well. We can’t attempt to apply chatbots into every single interaction and situation; hence why we need to understand when they are most useful. So of course, the best way to understand exactly how and when to positively leverage a chatbot, would be to understand exactly how and when and why chatbots are being used. Painting the technology and capability as a perfect solution, or an end to customer service agents, is not only being dishonest, it is just blatantly wrong. That is why we need to have a realistic conversation and discussion about this technology, just like with live chat, or video conferencing, or any other tool that is being promised to revolutionize the way we work. This is in reality, within a much more general sense, is a large issue with all Artificial Intelligence discussions. Chatbots are a very easy way to understand this. 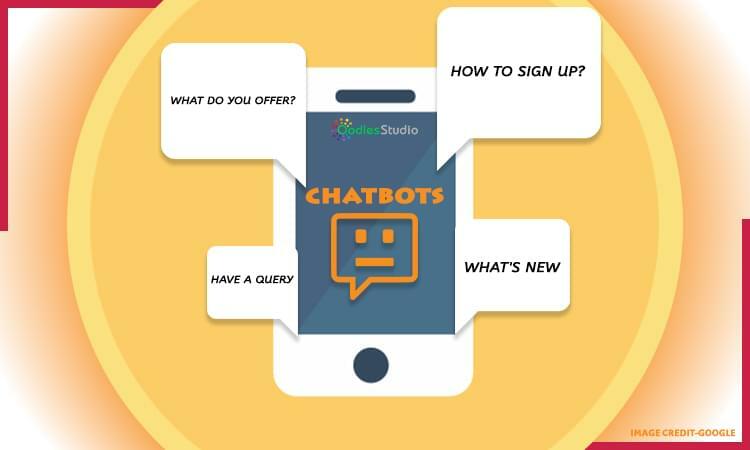 And when it comes to chatbots, companies are quick to hail their latest technology as the be all end all solution. At first, we saw many claiming that chatbots could be the end of human agents, or could revolutionize support structures. The reality is that chatbots fit in a very unique use-case and situation, and we have to learn what that is to better leverage it. 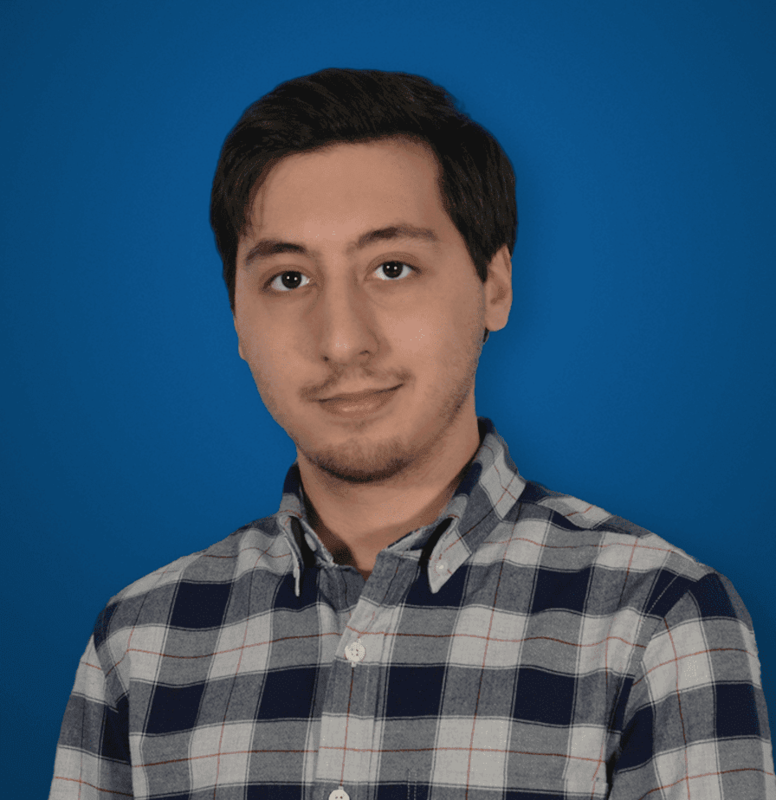 Again, understanding these real-world experiences and situations are what help us truly understand how, when and why we should be using chatbots. What is interesting is not only the capabilities of chatbots, but the wide use cases that they can fit into. While the hype can be dismissed as just hype, it is founded in some reality. Chatbots are moving beyond simplistic capabilities, and developers have begun leveraging the latest AI tech to make some truly powerful tools. These tools can then be used in either internal or external operations, and solve customer service issues, or simplify the process, when we weren’t even fully aware that the pain point even existed. 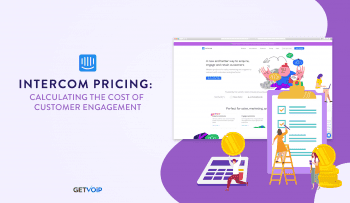 Vee isn’t just another reminder bot, or a tool that businesses can inject into their own website, but rather a very useful assistant for business owners to better manage and handle their entire Vonage Business platform and service. 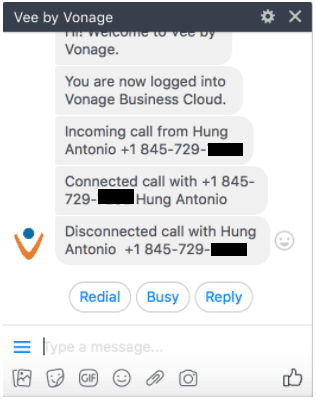 With the use of Vee, users can set up and manage accounts, set up and manage desk phones, add features like group calling or virtual receptionist to your Vonage service, provide guides and instructions how to even use your Vonage service, and receive trouble shooting assistance. 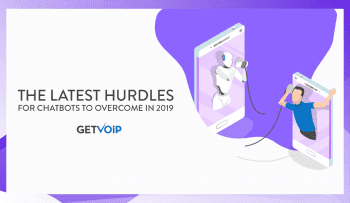 This makes Vee a fairly powerful virtual assistant, capable of assisting end users of Vonage’s Business Cloud in a multitude of ways, beyond superficial voice commands. Moving a bit away from the business side, I want to highlight a true consumer experience where a chatbot can really shine. 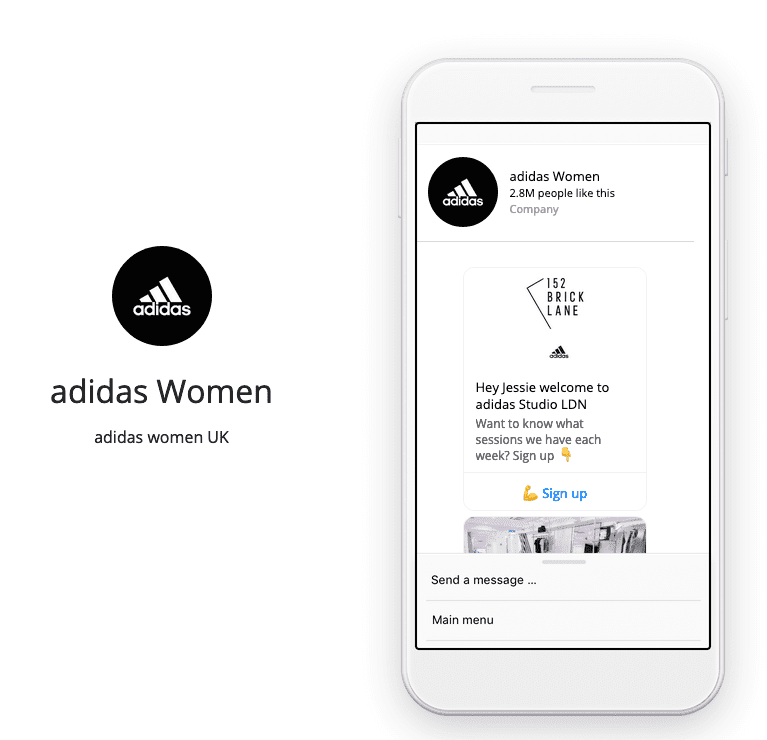 By leveraging Facebook Messenger, an incredibly popular chatbot platform for good reason, Studio LDN took advantage of an existing bot created by Byte London. This bot enables users to of course discover sessions organically, and register for them within a conversational interface. Users are already on Facebook Messenger, and are used to having super-fast paced conversations within their fast-paced lives. The idea for using a chatbot to enable registration and session information sharing is that users will immediately find out updates without having to reach out for them — they won’t be buried in emails, or spam calls that are ignored. Instead, users can directly interact with a bot, and receive updates in a messaging format that they are already comfortable and familiar with. Another great opportunity to improve customer service with chatbots is within the hospitality industry. When we’re staying at hotels, there will be an inevitable need to interact with the staff, whether that be housekeeping, concierge, or the front desk. But, who wants to have to pick up the phone and talk to a live person, especially when that’s at 4am and you need to complain about your neighbors, or order a bottle of wine? Of course, that’s exactly where a chatbot will come in. The Caesars Entertainment Las Vegas resort is a wonderful example of how a business can improve their guest services by leveraging chatbots. 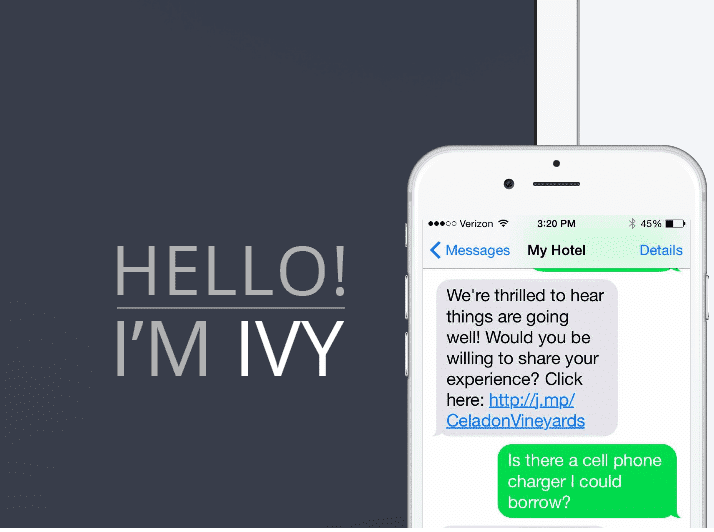 Back in December of 2016, they launched a pilot program introducing Ivy, a 24-hour virtual concierge service — the bot now serves more than 6,000 rooms. So not only is Domino’s making history by offering the easiest way to order a pizza, but they’re making some pretty big waves by how wide spready they are making their chatbot available, and expanding its capabilities. 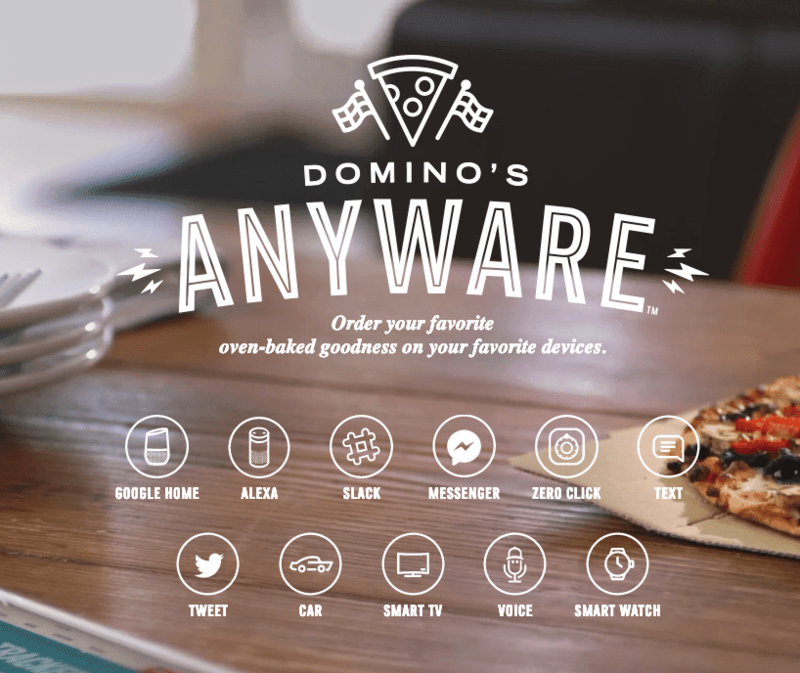 Through Facebook Messenger, texting, Amazon Alexa, Slack, Zero Click, Twitter, Smart Wi-Fi enabled cars, smart TVs, or even a smart watch, anyone can place an order through Domino’s Anywhere, and you can even do so with a simple emoji text. Of course, we can laugh about the silliness of ordering a pizza with just an emoji, but the reality is, Domino’s is leveraging the chatbot capability to introduce an entirely new shopping paradigm. In fact, a lot of the times, customers know exactly what they want, and they want as few steps as possible to get to it — that’s the idea behind a frictionless experience. So how much less friction can you get than turning an emoji text into a pizza delivery? The idea here is that Domino’s is using chatbots a bit beyond what we would expect, they’re thinking outside of the pizza box. Instead of offering a simple conversational interface, forcing users to then tell a bot what they want on their pizza, they’re removing all the steps and just going straight to pizza. And so, taking that concept that Domino’s has, utilizing short-hand communication with emojis, Whole Foods goes even further. With their own Facebook Messenger Bot, Whole Foods has created an entirely new way for users to discover entirely new healthy recipes. 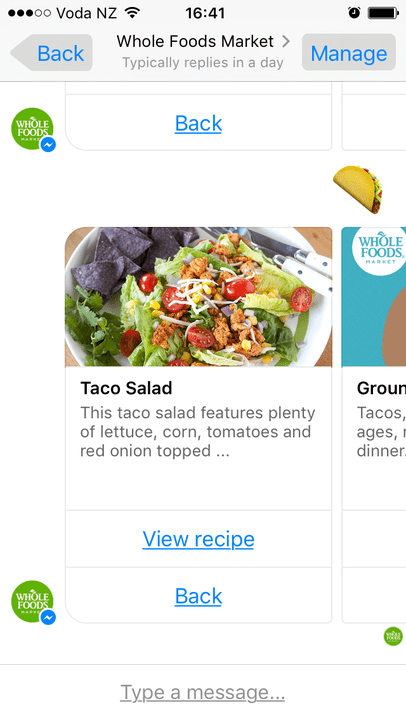 Interacting with the Whole Foods Culinary AI is of course just a simple Facebook messenger conversation — and the bot will ask users what it can help them with. But as Digital Trends pointed out, users don’t have to stick with just basic words. By throwing emojis into the mix, Whole Foods has managed to create an interactive bot that reduces the friction of explaining to a robot what you mean, while still managing to provide a truly interactive and positive experience. Digital Trends put together a good overview. Whole Foods does say that users can add text to modify recipes to fit into any special diets as well, and again this is all about removing the friction and making an easy experience. People want bots for simplicity, and Whole Foods has provided that simplicity. Chat bots can be a really great tool in the customer service arsenal, but it is an absolute matter of understanding precisely how and when to properly apply this tool – we cannot take a scorched earth approach and aim to replace everything. We don’t use hammers for every job, and we don’t use screwdrivers for every job — so why would we use live human agents for every job, and conversely why would we expect to use chatbots for every job? Without getting too much into the debate of automation, robots will never fully replace humans — and that is very clear when it comes to Customer Service and Engagement specifically. Humans appreciate and crave those human interactions, especially when they are frustrated, confused, or even hungry. But, more importantly, customers crave simple and easy interactions, it just so happens that humans can provide these. And chatbots can provide them too, it is just a matter of identifying when and why users do not want to use chatbots, and properly identifying when they want to use them and how we can enable customers to use them better.